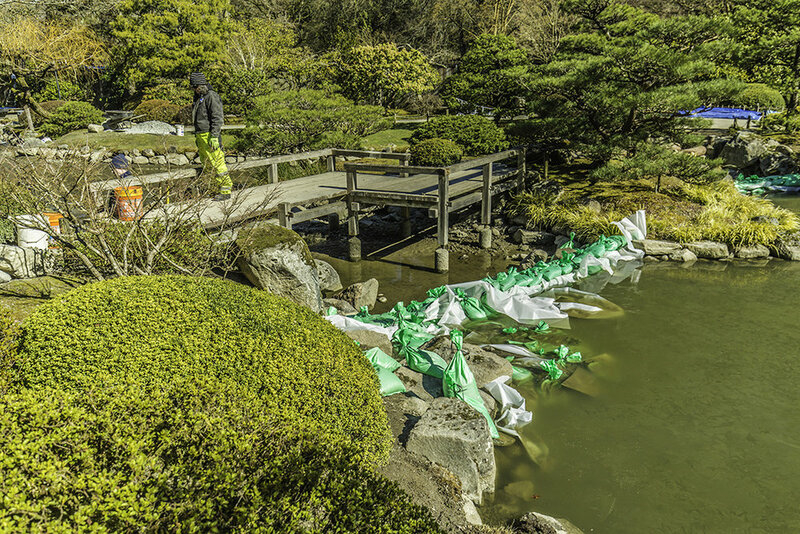 During a typical winter closure the Japanese Garden receives in-depth maintenance; the skilled care and repair that a garden of this quality requires. The winter of 2019, however, has been anything but typical. Besides getting buried in several feet of snow, the Garden has undergone a major pond restoration project, years in the making. This one of the most challenging and rewarding winters for me and my team since I started as Senior Gardener. When I began working here over three years ago, one of my first tasks was to get to know the critical infrastructure needs of the Garden. As the largest single feature within the Garden, the shoreline erosion of the pond was particularly concerning—overtime, both the structural integrity and the overall appearance had come to suffer. This also began affecting several important specimen trees, including several shoreline maples and the sculpted pines on the islands. I began looking into methods for restorative maintenance of an unlined pond. I spoke to engineers, landscapers, architects, and gardeners from New Jersey to Kyoto looking for ideas. In my research, I paid close attention to the aesthetic principals and the functional requirements that would need to be met in the finished project. The unique challenge was to find a way to execute such precise work in an established garden that’s also part of an active natural watershed. By the end of summer 2018, the research was complete and Seattle Parks and Recreation (SPR) had a draft plan to restore the north half of the Japanese Garden’s pond shoreline, improve the water quality, and maintain or even improve on the Garden’s beauty. Around the same time, the Arboretum Foundation was able to secure support and funding to move forward with the project. Early in the process, SPR assembled a work team comprised of gardeners from the Landscape crews, Kubota Garden, and turf crew in addition to our regular Japanese Garden staff. We defined the scope of the project, and carefully broke down the tasks to ensure that each part fit together like puzzle pieces and we could successfully complete this multi-step process. Working with SPR engineers and its Natural Resources Unit management team, I helped prepared our proposal, and began to finalize planning and permitting so the work could begin. Once the snow finally melted, we started with erosion control and sediment removal, two of the core tasks for this project. To accomplish this, we first needed to drain out half of the pond. As we began the damming and dewatering, we were faced with the challenge of how to move and ­manage the Koi. By a stroke of luck, the majority of the fish were already in the south half of the pond when we built the temporary dams. Nonetheless, the team did spend an afternoon relocating numerous fish, turtles, and even crayfish to the south end of the pond for the duration. With shoring up the eroded banks, our challenge was to arrange and set the stones in a way that maintains both the physical strength and naturalistic beauty of this garden. Given how delicate the site is, we couldn’t bring in heavy equipment for the task. This meant almost all the rocks—each one weighing up to 400 pounds—needed to be moved and set painstakingly by hand. Not to mention, the work had to be performed around existing specimen trees, rock placements, gates, and pathways, complicating the process considerably. Nearly 12 tons of Bandera granite went into this project. This is the same material that the garden was built with in 1960 and, fortunately, it’s still available. The team paid careful attention to maintaining the original design intent and sought to fit the new material seamlessly into the existing landscape. Much of the stone installed will never be seen, yet below the water’s surface, or set deeply into the soil, they’ll serve the garden’s vision of natural grace and stability. One of the more visible improvements that’s taken place is the restoration of the dobashi (earth bridge) between the East shore and central island. 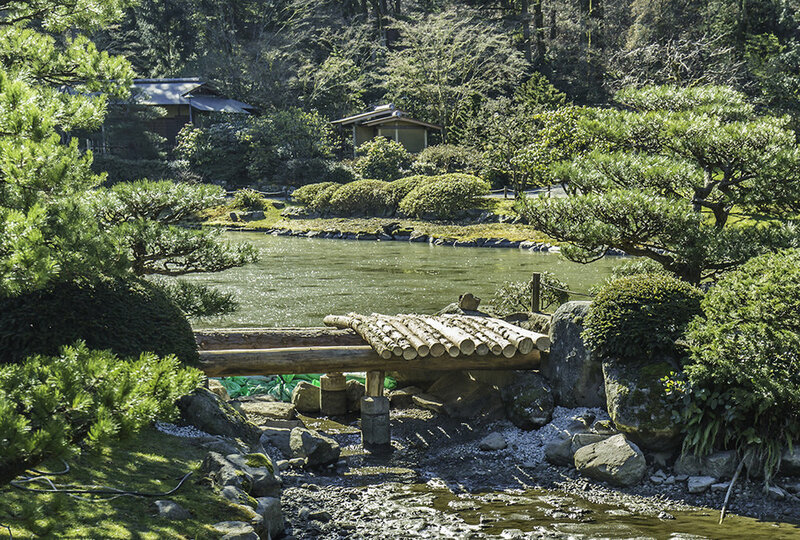 The bridge was restored by SPR carpenters who worked from the original 1959 drawings provided by Juki Iida and Kiyoshi Inoshita, and it reflects the ideals of natural materials treated with care and respect that are so integral to the Japanese Garden. As we draw to completion, we are planning on restoring the shoreline planting with a combination of traditional Japanese plants and complimentary natives. This work will continue throughout the spring, taking time to ensure that new plantings blend harmoniously with the existing plants and design. The most immediate impact that I expect will be a rapid improvement of water quality. The pond will now be deeper with a much greater volume and a significant reduction of organic matter, all of which will reduce the opportunities for algae bloom and nitrogen build up. The shoreline will appear healthier, too, especially in the long run, with invasive plants removed and more healthy rooting material added for the pines on the islands and other water-side specimen trees. The improved stability of the shoreline allows the gardeners to perform better regular maintenance in areas that were difficult or dangerous to access in the past. Most importantly, performing this major project has helped ensure the continuation and quality of the Garden for decades to come. This hasn’t been a typical winter closure. When you return to the garden in the 2019 season, I hope you’ll feel rewarded for your patience, and take the time to appreciate the lasting improvements that you’ve helped make possible. Peter Putnicki is the Senior Gardener for the Seattle Japanese Garden. P. S. Opting to work the pond in two halves versus trying to take it all on at once was a difficult decision to reach. Ultimately, reducing the scope allowed us to maintain quality and reduce additional costs and closures. It also allows us to make adjustments and learn from our successes and set-backs moving forward. This also means that we will need to enact a second phase for the South end of the pond in the next several years, and the funding for this project has yet to be secured. This is a wonderful opportunity to join in our Garden as it continues to dynamically grow and express its unique, authentic beauty. For more information on how to support Phase 2, click here.